The fascinating thing about forex day trading is that you can trade 24 hours a day. Sorry to say, but that does not mean you should. Day traders should only trade a forex pair when it is active and when there is a lot of volume and transactions are taking place. 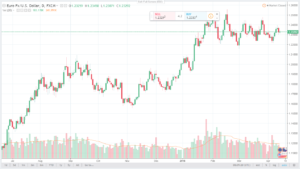 The EUR/USD has acceptable hours of day trading because there is an adequate amount of volatility to generate profits which are probably higher than the cost of the spread and or commission. To be good at it and capture the most substantial moves of the day, day traders hone in even further, always day trading only during a specific three to four-hour window. The forex market is open 24 hours a day during the week since there is always an international market open somewhere else as a result of the time zone differences in countries and continents. But not every global market actively trades every currency. For that reason, different forex pairs are actively sold by traders at different times of the day. Once London and Europe are open for business, pairs that involve the Euro or British pounds are the most actively traded. And when New York (U.S) and Canada are open for business, pairs that comprise the USD and the Canadian dollar are more active. If your plan is to day trade the EUR/USD, the times that are prone to be most active for the pair (on average) will be when London market and New York are open. Those markets time of operation is between 0800 and 2200 Greenwich Mean Time (GMT). If you like to see significant market hours in your time zone, or your broker’s time zone, please use the forex market hours’ tools. The hourly volatility chart gives you an idea of how many pips the EUR/USD moves each hour of the day. Times are in GMT. There is a significant increase in the amount of movement starting at 0700, which goes on through to 2000. After that movement, each hour begins to thin down, so there are expected to be fewer big price moves day traders can involve their selves. Day traders should if possible trade between 0700 and 2000GMT. If you trade outside of these hours, the pip movement may not be large enough to compensate for the spread and or commissions. Volatility changes after a while. For instance, daily average volatility (at the time of writing) is 100 pips per day. The average regular movement may rise to 130 pip per day, which means each hour is expected to experience, to some extent, higher pip movement. Average daily flow may go down to 75 pips per day. While overall volatility possibly will change, the hours which are most volatile commonly do not change too much. 0700 to 2000 GMT will remain the most acceptable time to day trade, despite the consequences of whether daily volatility increases or decreases. Note that daylight savings time could affect trading hours in your area. 0700 to 2000 GMT are good enough hours for day trading the EURUSD. There is an ample movement to take out a profit and cover spread and commission overheads, potentially. In an ideal world, though, you should day trade the EUR/USD between 1300 and 1600 GMT. It will get the most out of efficiency. During this period you will witness the most significant moves of the day, which means tremendous profit potential, and the spread and commissions will have the slightest impact relative to potential profit. Besides, London and New York are both open during this three-hour window. That means a lot of volumes will be coming in from the two foremost markets in the world, so spreads are typically tightest at these times. 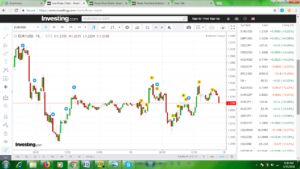 Are you Looking for a day trading strategy to trade during these times? Not every person is an around the clock day trader and as a result, cannot choose when they trade. If you cannot trade at the duration of the ideal window of 1300 to 1600 GMT, then day trade the EUR/USD at some other point between 0700 and 2000 GMT. Trading at these times takes full advantage of profit potential due to the size of the price moves, and spreads are typically at their lowest during these times as well.